Twenty-two Shetland ponies in England are moving on to new lives after being rescued from neglect. The British animal charity Blue Cross says 16 have already been found suitable homes, following their recovery. Homes are still actively being sought for two of them, named Flopsy and Mrs Tittlemouse, while the other four – Timmy Tiptoes, Babitty Bumble Bee, Mrs Tiggy Winkle and Hunca Munca – have yet to be signed off for rehoming. Blue Cross says the ponies, all named after Beatrix Potter characters by staff at its rehoming centre in Burford, were emaciated and neglected when taken into its care. They were found belly-deep in mud with no food or water, in Leicestershire. Some were in such a terrible state that they had to be euthanised. Following the successful prosecution of their owner for neglect, the surviving 22 ponies were transferred to Blue Cross’s Burford operation. The charity’s horse team worked to rehabilitate them, allowing many to ultimately go off to loving new homes. 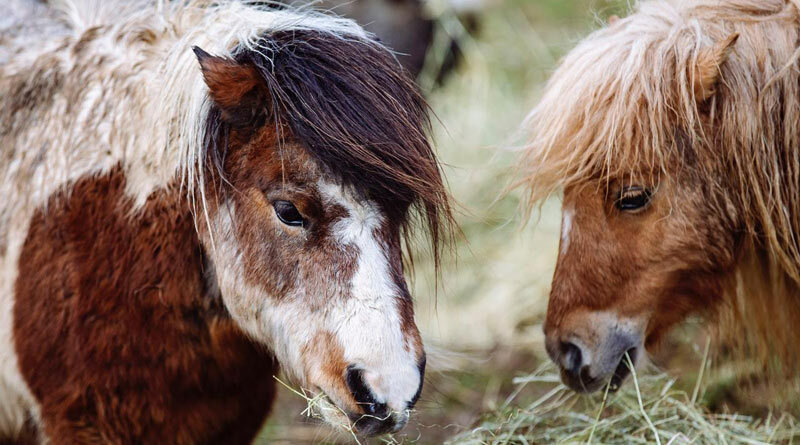 Blue Cross regularly works with organisations such as the RSPCA to help rehabilitate and rehome horses and ponies who have been seized in welfare cases. “On arrival, the ponies were in a really sad state,” recalls Vicki Alford, who is horse manager at Blue Cross’s rehoming centre in Burford. “It was heart-breaking to see. “All had over-grown and curled up hooves, were riddled with lice and very underweight. “The transporter who brought them to Burford described the place where they were found as horrific – apparently there was no food or water and they were stood in mud up to their tummies. How they survived is anyone’s guess. The charity hopes to find homes for Flopsy and Mrs Tittlemouse soon, with Timmy Tiptoes, Babitty Bumble Bee, Mrs Tiggy Winkle and Hunca Munca getting ever closer to being cleared for rehoming. Blue Cross says it costs up to £300 a day to keep a horse, depending on how much vet, farrier and training intervention they need.